"Go All the Way (Into the Twilight)"
Twilight: Original Motion Picture Soundtrack is the official music for the 2008 film Twilight, released on November 4, 2008. The soundtrack was chosen by music supervisor Alexandra Patsavas; while the score, Twilight: The Score, was composed by Carter Burwell. The soundtrack album was released by Patsavas' Chop Shop label in conjunction with Atlantic Records. It debuted at #1 on the Billboard 200, having sold about 165,000 copies in its first week of release, 29% of which were digital downloads. 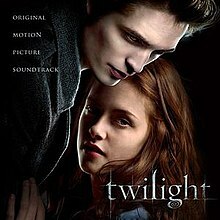 Twilight: The Score was made available for digital download on November 25, 2008, and the album was released to stores on December 9, 2008. Twilight is the best-selling theatrical movie soundtrack in the United States since Chicago. Both the soundtrack and the lead single, "Decode" by Paramore, were nominated for the 2010 Grammy Awards. Director Catherine Hardwicke revealed in an interview with MTV that a song by alternative rock band Muse, later revealed to be "Supermassive Black Hole", would be included on the film's soundtrack. The soundtrack includes two songs by Paramore, a new song by Mutemath, and an original song for the film by Perry Farrell. "Flightless Bird, American Mouth" by Iron & Wine was chosen for inclusion in the movie by actress Kristen Stewart, who plays Bella Swan. The soundtrack won a 2009 American Music Award for Favorite Soundtrack. The CD booklet on the physical CD folds out into one of four Twilight posters. Hot Topic locations across the United States hosted exclusive Twilight soundtrack listening parties on October 24. Albums bought at Borders bookstores feature an acoustic version of Paramore's "Decode". Summit Entertainment provided a free remix of "Bella's Lullaby" through iTunes, with the purchase of a Twilight theatre ticket through online ticket services Fandango or MovieTickets.com. 6. "Go All the Way (Into the Twilight)"
13. "Love Is Worth the Fall"
The first song of the ending credits, Radiohead's "15 Step" (3:59), was not included on the soundtrack. "Decode", by Paramore, was the first single released from the soundtrack. It premiered on Paramore's fan club site and Stephenie Meyer's official website on October 1, 2008. The music video for "Decode" premiered on November 3. The song was certified Platinum in the U.S on February 16, 2010, selling over 1,000,000 copies. It was also nominated for a Grammy Award in 2010 for Best Song Written for a Movie. "Go All the Way (Into the Twilight)" by Perry Farrell was the second single released from the soundtrack. It premiered on Meyer's website on October 23, 2008. The Twilight soundtrack debuted at #1 on the Billboard 200, selling 165,000 copies in its first week, according to Nielsen Soundscan. Twilight is the first soundtrack to hit #1 in advance of its film's release since the 8 Mile soundtrack in 2002. The album was certified double platinum on April 16, 2009. After a re-release of the album in a "Deluxe Edition" in March, 2009, it climbed from #14 to #3 on the Billboard 200, selling 74,000 copies. It remained on the Billboard 200 for 48 consecutive weeks. As of April 2014, the album has sold 2,807,000 copies in the US. The soundtrack peaked at number one in New Zealand on February 9, 2009 and has been certified platinum, selling over 15,000 copies. The album has been certified gold in Mexico, selling over 50,000 copies. The soundtrack has sold over 3.5 million copies worldwide. Carter Burwell composed and orchestrated the score for Twilight over a 9- to 10-week period, and it was recorded and mixed in about 2 weeks in late September 2008. He began the score with a "Love Theme" for Bella and Edward's relationship, a variation of which became "Bella's Lullaby" that Robert Pattinson plays in the film and that is included on the Twilight Original Motion Picture Soundtrack. The original theme is featured throughout the film, and serves to "play the romance that drives the story". Another theme Burwell composed was a "Predator Theme", which opens the film, and is intended to play Edward's vampire nature. Other themes include a bass-line, drum beat and distorted guitar sound for the nomadic vampires, and a melody for the Cullen family. Twilight: The Score was released digitally on November 25, 2008 and in stores on December 9. The score album had sold 218,000 copies in the United States as of June 2010. ^ Phares, Heather. "Twilight - Original Soundtrack". Retrieved 19 August 2011. ^ Greenblatt, Leah (30 October 2008). "Twilight Review". Retrieved 19 August 2011. ^ James Montgomery (2008-09-19). "Are Pop-Punks Paramore A Good Fit For 'Twilight'?". MTV. Retrieved 2008-09-22. ^ Mikael Carlsson (2008-06-10). ""Twilight" Assigned to Carter Burwell". Film Music Magazine. Retrieved 2008-09-22. ^ a b James Montgomery (2008-09-18). "'Twilight' Exclusive: Paramore To Contribute Two New Songs To Film's Soundtrack". MTV. Retrieved 2008-09-19. ^ a b Katie Hasty (2008-11-12). "'Twilight' Bumps AC/DC From Atop Billboard 200". Billboard. Retrieved 2008-11-12. ^ "Week Ending April 12, 2009: Breaking Records With Rascal Flatts - Chart Watch". New.music.yahoo.com. Archived from the original on 2012-07-11. Retrieved 2010-06-19. ^ John Sinkevics (2009-12-03). "Grammy nominees Beyonce, Taylor Swift, Lady Gaga, 'Twilight' clean up at pop show debate". MLive.com. Michigan Live LLC. Retrieved 2009-12-10. ^ Erica Futterman (2008-08-08). ""Twilight" Author Stephenie Meyer on Her Musical Muses, Upcoming Movie and Mermaid Dreams". Rolling Stone. Retrieved 2008-08-17. ^ Jada Yuan (2008-09-19). "Exclusive: Perry Farrell to Write Song for the 'Twilight' Movie, Possibly Reunite Jane's Addiction". New York Magazine. Retrieved 2008-09-22. ^ "On the scene: 'Twilight' Q&A with Robert Pattinson and Catherine Hardwicke". Entertainment Weekly. 2008-11-04. Archived from the original on 2008-12-10. Retrieved 2008-11-05. ^ "2009 American Music Awards". ABC.com. Archived from the original on November 25, 2009. Retrieved 2009-11-23. ^ James Montgomery (2008-10-16). "'Twilight' Soundtrack To Be Previewed At Hot Topic Listening Parties". MTV. Retrieved 2008-10-16. ^ "Borders Is 'Twilight' Central this Season with Vampire Inspired Books, CDs, Calendars, Gifts, Free In-Store Parties, Exclusive Online Content, Podcast and More!" (Press release). MarketWatch. 2008-11-04. Retrieved 2008-11-06. ^ Jennifer Vineyard (2008-10-31). "UPDATED: 'Twilight' Trick Or Treat - Ticket Presales To Begin On Halloween". MTV. Retrieved 2008-11-29. ^ "Hayley Williams on Twilight". TwilightTheSoundtrack.com. 2008-10-01. Retrieved 2008-10-16. ^ "***October 1, 2008***". StephenieMeyer.com. Retrieved 2008-10-13. ^ "Video Premiere: Paramore, 'Decode', from the 'Twilight' Soundtrack". MTV. 2008-11-03. Retrieved 2008-11-03. ^ "Perry Farrell song unveiled!". TwilightTheSoundtrack.com. 2008-10-23. Retrieved 2008-10-28. ^ "***October 23, 2008***". StephenieMeyer.com. Retrieved 2008-10-28. ^ Paul Grein (2008-11-12). "Week Ending Nov. 9, 2008: The Vampire That Rocked The Chart". Yahoo. Retrieved 2008-11-13. ^ "Gold & Platinum - June 18, 2010". RIAA. Archived from the original on June 26, 2007. Retrieved 2010-06-19. ^ "'Now 30,' 'Hannah Montana' Lead Busy Week On Billboard 200". Billboard.com. 2009-09-14. Retrieved 2010-06-19. ^ Paul Grein (2009-03-25). "Week Ending March 22, 2009: Winning Despite The Odds". Yahoo! Music. Retrieved 2009-03-26. ^ Keith Caulfield (2009-03-25). "Kelly Clarkson Stays On Top Of Billboard 200". Billboard. Retrieved 2009-03-26. ^ Paul Grein (April 23, 2014). "Chart Watch: "Frozen" Gets Hotter". Yahoo Music. Retrieved April 27, 2014. ^ "RIANZ". RIANZ. Archived from the original on 2008-12-04. Retrieved 2010-06-19. ^ "RIANZ". RIANZ. Archived from the original on 2011-07-09. Retrieved 2010-06-19. ^ "Representando a la Industria Argentina de la Música". CAPIF. Archived from the original on 2002-09-14. Retrieved 2010-06-19. ^ "Radio 1 - The Official Chart with Reggie Yates - UK Top 40 Compilation Albums". BBC. 2010-06-13. Retrieved 2010-06-19. ^ "Best of 2009 - Billboard Top 200". Billboard. Nielsen Business Media, Inc. Retrieved 2011-10-16. ^ Phares, Heather. "Twilight [Original Score]". Retrieved 19 August 2011. ^ "Pandora Archive" (PDF). Pandora.nla.gov.au. 2006-08-23. Retrieved 2010-06-19. This page was last edited on 25 January 2019, at 19:40 (UTC).